Rarely do we see young children hunted and killed in a slasher movie. But that's exactly what French filmmakers Julien Maury and Alexandre Bustillo wanted to do with their version of A Nightmare on Elm Street. Way back in 2008, the duo was sought to reboot the iconic horror franchise for Platinum Dunes and New Line CInema. Perhaps their take on Freddy Krueger was just a little too much for the executives at the studio to handle. Cause the job eventually went to music video director Samuel Bayer. And man, did he ever fail at his job! Maybe Julien Maury and Alexandre Bustillo's version wouldn't have been better. We'll never know. But it sure sounds a heck of a lot more interesting. In fact, the pair's plans might be the only real way to go somewhere new with Freddy. 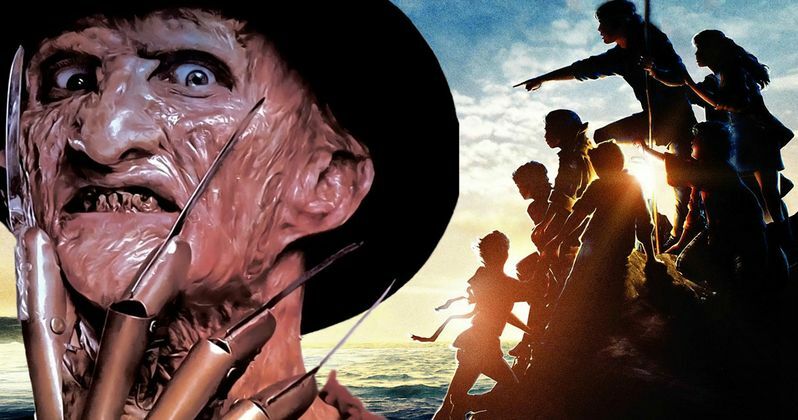 Speaking with Bloody Disgusting about their new French slasher flick Among the Living, which just came out in the UK, the filmmakers revealed their pitch for A Nightmare on Elm Street, which would have brought Freddy into the type of world associated with Steven Spielberg's Amblin Entertainment. "Our idea of a good remake is to have a new vision on the same thematics. Here it was to really use the fact that Krueger is a child molester. So the idea was to have a twisted version of the 'Goonies' with a bunch of kids being stalked. We thought it would have been great for a remake to switch the teenagers of the original with real kids. Beside childhood is the moment in life when you are truly and deeply frightened by nightmares, when you're not able to see the difference between reality and dreams..."
This idea sounds like it would have made A Nightmare on Elm Street truly terrifying again. But the horror genre has notoriously shied away from killing off kids. And even in most slasher movies, the teenagers are played by obvious adults. The pair actually get to play around with this concept in Among the Living. Here's the synopsis for their latest movie, which doesn't have a U.S. release date yet. "Youngsters, Victor, Dan and Tom skip school to wander around an abandoned movie set. They stumble upon a horrific vision: A woman in chains is dragged through the field by a man wearing a clown mask. The masked man catches a glimpse of the boys, who scramble to run away. But, before they can escape, they see something which has been hidden for years, something they were not meant to see. Terrified of having been seen by the masked man, the boys try to alert the police. Unfortunately, their past record of unruly behavior discredits them and the police do not follow up on their tipoff. That night someone breaks into their homes, seeking to eliminate them...one after another...They are going to meet Klarence..."
While they don't get to play with Freddy Krueger on screen, the French duo will be bringing another iconic slasher to theaters everywhere. The pair are the one's responsible for the upcoming The Texas Chainsaw Massacre prequel Leatherface, which shows the maniac's twisted origins as a teenager. Bloody Disgusting claim the movie is absolutely insane. What do you think about their original idea for A Nightmare on Elm Street? Better than what we got in 2010, right?